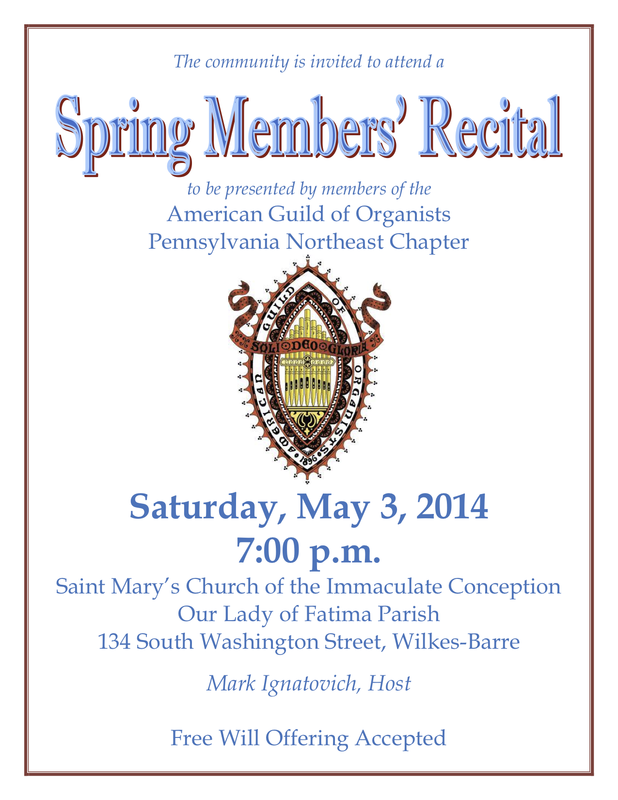 Our Spring Members’ Recital will be held on Saturday, May 3 at 7:00 p.m. at Saint Mary’s Church of the Immaculate Conception, 134 South Washington Street in Wilkes-Barre. Mark Ignatovich will be the host organist for this event. The church’s more than century-old organ, built by the Müller and Abel Organ Company, was refurbished by Patrick J. Murphy and Associates in 2013. The instrument has three manuals (Choir, Great, and Swell) and pedal with 46 ranks of pipes. All chapter members are invited to participate! If you are interested in performing, please contact Mike Sowa by Wednesday, April 23 with the titles and composers of the pieces you would like to perform. Classical organ compositions, hymn-based works, and improvisations are welcome.